Sign up for this class if you want to take this single class only. If you want to sign up for the club, sign up under that heading. You do not need to sign up for this class. 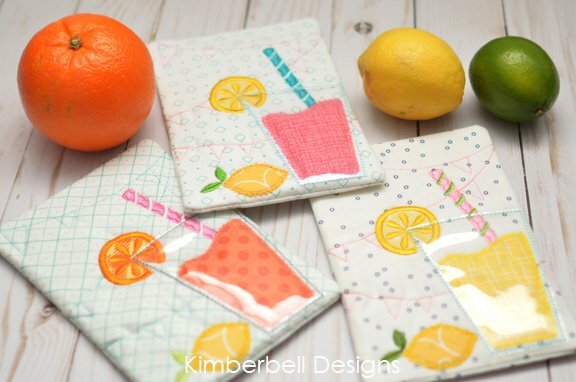 Stitch the quilted pennant background in a contrasting color for celebration, or blend with the background fabric to emphasize the drink and slice of citrus garnishing the cup. You'll find this mouthwatering design delish for an entire mixology of sodas! USB stick compatible with your machine. We will have some available to purchase in class. Consider getting a dedicated USB stick if you are joining the club. The design each month will be added to your USB stick. Fabric kit - Kits will be sold at the beginning of class. Fee for this kit is $4. Assorted embroidery thread in citrus colors. We will have embroidery thread to share in class also.